A day after a train mowed down over 60 people, a number of people staged a sit-in on railway tracks on Saturday, demanding action against the erring officials and train driver and seeking adequate compensation for the victims. Later, the police chased away the protesters when they tried to move towards residential areas from the railway tracks. 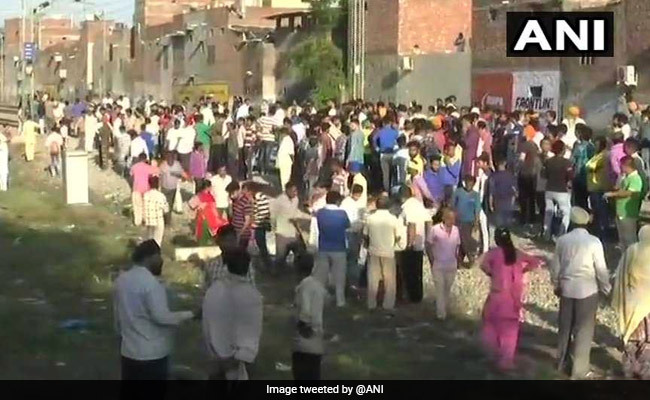 At least 61 people were killed and 72 injured on Friday evening after a crowd of Dussehra revellers that had spilled onto railway tracks while watching burning of Ravana effigy was run over by a train near here, officials said. "Why did the government not ensure proper security arrangements at the time of Dussehra festival? Why such function was allowed to take place near railway tracks?" Sujit Singh, one of protesters, said. Punjab Chief Minister Amarinder Singh on Friday announced immediate ex-gratia compensation of Rs 5 lakh each to the next of kin of those killed. "The tragic incident could have been averted, had Navjot Kaur Sidhu turned up at the venue on time and had the function not been delayed," said Deepak who works as a painter. He said that every year, the effigy of Ravana was burnt between 5.30 pm and 6 pm, but this year it could not happen as Navjot Kaur Sidhu, who was the chief guest at the event, "got late". The effigy was burnt around 7 pm. "Because of darkness, the tragedy occurred," he added.